1 Lb. Sweet and/or Hot Sausage Links, or a mix of the two. I like the local brand “Gianelli” grilled or pan fried, (but not overcooked) broken into rough chunks about a half inch thick, by hand. 1 Large Red Onion (cut in half pole-to-pole, then into 1/2″ slices side to side, then cut the slices into 3/4″ chunks and break apart ). 16 oz White mushrooms, tough stems removed, chopped into chunks. Place the oven rack as close to the bottom as possible. Place the pizza steel on the rack and preheat to 550°F for at least an hour. Lightly sauté the onion in a little (1 – 2 tsp) of Olive Oil until it’s slightly softened. Sauté the mushrooms in a little Olive Oil until they have released most of their moisture and browned slightly. Sprinkle corn meal on the pizza peel (be generous). Flatten the dough by poking it down gently with your fingers more towards the edge then the center. It should be roughly a “flying saucer” shape. Then gently stretch it out and lay it on the pizza paddle. If you’re coordinated and want to impress the guests, this is the time to toss it in the air and give it a spin. Make sure you can slide the dough around on the peel, since a stuck pizza is Really Bad. Add a layer of Mozzarella (the cheese goes on first to keep the sauce from making the crust soggy) and a half-dozen blobs of sauce. 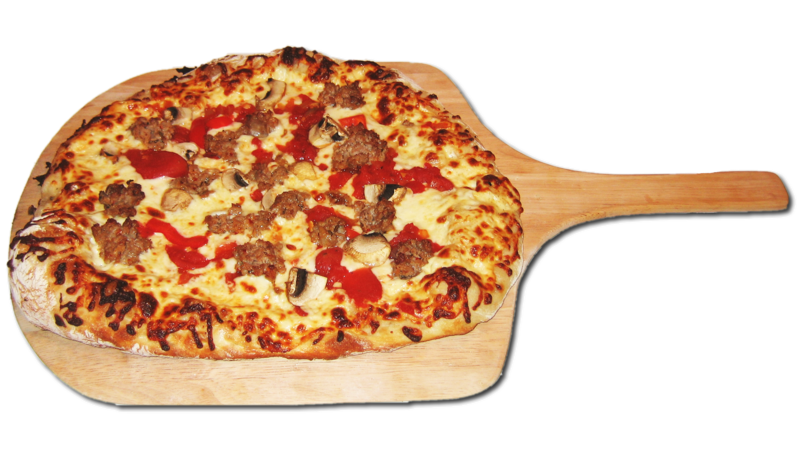 The sauce spreads out while cooking, so don’t use too much or your pizza will be soggy. Sprinkle on some sausage. Break the chunks apart with your fingers before you add them. Grate fresh Parmigiano Reggiano over the top, lay down a dozen or so Basil leaves and drizzle with a little bit of Extra Virgin Olive Oil. Slide into oven on hot steel and bake until the top is browned and the bottom is crispy.